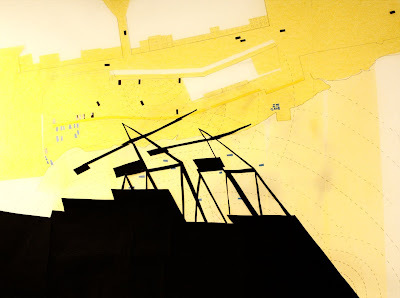 Drawing illustrating the light pollution at night and imposing morning shadow on the site, both due to the freeport. 2. Noise from freeport - 24 banking and clanking of containers, generators. 3. Noise from planes flying overhead. 5. Pollution from Gas Tanks, Power Station, Ships. 6. Feeling of all the island's rubbish being thrown down here - social divide/inferiority? 7. Feeling of being unknown/forgotten by the rest of the island. 8. cannot swim due to sea pollution.